You have a deadline and instead of working, you're busy swindling with various things like social media, watching videos and checking Facebook updates. 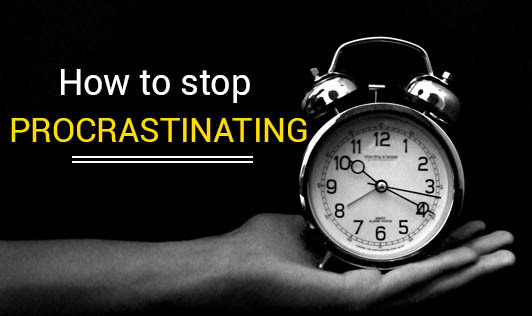 Procrastination is an automatic process that leads to pointless postponement. This happens to all of us, but it may be affecting your productivity. People often procrastinate when they want to avoid doing something that may bring unpleasant thoughts of feelings for them, says Suzie Plush, a psychologist based in Sydney. Delaying things and repeating this cycle all over again is a bad habit that prevents one from achieving better results in life. • Start with the most difficult task: Finishing the most difficult task on your list of things-to-do will make you feel extra productive and give you the boost to do other things you've been pushing aside. If your task is something that can't be done in one sitting, then break into manageable, bite sized steps. Also, have your to-do-list placed somewhere you will see it on a regular basis. As you mark things off your list, you will be motivated to continue doing so. • Eliminate distractions: Get rid of distractions around you, it doesn't hurt to turn off your email and Facebook notifications for a short period of time. • Be around people who inspire you to take action: The people you are with influence your behaviour to a large extent. Identify people who trigger you, most likely the hard workers. The more you interact with such people, the sooner you will inculcate their drive and spirit too. • Change your environment: Your environment has a great impact on your productivity. If you're falling asleep or feeling lazy, you should look into changing your workspace. An environment that makes you feel inspired may lose its effect after a period of time. Consider revamping your workspace! • Reward your progress: Reward yourself! Celebrate progress and small successes as you go along. You can watch a movie or treat yourself, make it something that acknowledges your effort. • Just do it: Remember that you can do all the planning and strategizing, but if you don't take action, nothing's going to happen. Get a grip on yourself and do it! With a new perspective and a detailed plan, you'll be on your way to ending the procrastination cycle!